Don't lose privacy in the name of motivation. Zoho Motivator is an add-on sales management tool for Zoho CRM. When you sign up for Zoho Motivator, you're already protected by the security measures included in Zoho CRM. The Motivator team has also come up with some enhancements to ensure that the data you process under Zoho Motivator stays safe. These updates are focused on making Motivator GDPR compliant. Motivator TV is a broadcasting tool on which you can create channels and share relevant dashboards to hype up your teams. Often, these channels contain sensitive information which should only be seen by your Motivator users. Now, new TV channels that you create will be shared only with other Motivator users by default. To share a channel with more collaborators, just head to the channel settings and pick the appropriate level of sharing security. You can also easily change the link for the channel at any time, and no one will be able to access the previous link. Requesting access to your data. Exporting your data is now more private. 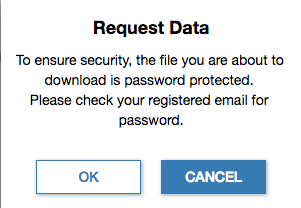 Upon request, you can receive a copy of your Motivator data as a password-protected zip file. This data backup is accessible only to the Super Admin. A small change can have a big impact. Tracking what activities happen with your software helps you better manage your sales tools and data. These logs are now available to admins under your privacy settings, so they can keep track of new operations in Motivator such as creating and deleting KPIs and targets. We hate to see you go, but if you ever have to, just know that your data goes with you. At your request, we will delete your entire organization's Motivator data. After a grace period of 60 days, Zoho Motivator will no longer have any of your data or your customers' data stored on our servers. The new privacy enhancements will be reflected in the Zoho Motivator app. You can easily make data requests or manage your privacy settings from your mobile device. *Disclaimer: The information presented herein is not to be construed as legal advise. Please contact your legal advisor to know how GDPR impacts your organization and the best ways to comply with GDPR.